After the previous day’s entry mentioning the likelyhood of a victory for General Franco in the Spanish Civil War, Thomas talks at greater length about the conflict here. He appears unsure about the General but has uncompromising views on the Republican cause, characterising them as an ‘unwashed band of murderers’. Many people would have disagreed with his views at this time. Between 32,000 and 35,000 people travelled to Spain from all over the world to assist the Spanish Republican forces in their struggle against Franco in 1936. 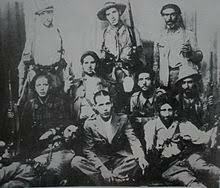 These forces came to be known as the International Brigades. Around 2,400 of these people came from Scotland. Thomas is politically a Conservative and was not likely to support this movement as it was closely affiliated with the Labour and Communist Parties and the Trade Union movement. However, he is realistic enough about what he has heard in the media to remark that ‘it is doubtful if 1 per cent of any of us know anything worth mentioning about the real facts of the matter at all’.